With latest announcement of Lightning Web Components, Salesforce development ecosystem (Lightning Platform) moves one step closer to using web standards of UI development. It is definitely quite welcome move, as it helps in learning and utilizing skills which are not confined to Salesforce ecosystem. You must read this official Salesforce blog post to get more background details on why and what of lightning web components. In short, prior to web components, one had to utilize an external library/ framework (like Angular, React etc.) and build your application on top of it. 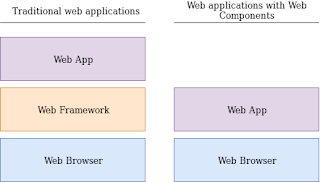 So essentially, your application runs on top of the external library/ framework and which in turn runs on the browser. With latest innovations within web development world and addition of custom elements, shadow DOM (don't confuse with virtual DOM), and content template element, browsers are now equipped to execute custom web components themselves, without needing any external library. It can be related to running a video using HTML video component vs using Adobe Flash for running videos (not quite literally). Lightning web components, leverages these new web standards (or browser improvements) and allows developers to create web components which can work within Salesforce Lightning platform. Remember, web components allow you to combine UI and processing. To create a web application, you still need security, access to server services/ data. This is where Lightning web components come into place. Salesforce Lightning web components provides these additional capabilities (security, lightning data service). With these, we can create standard web components which can interact and work with Salesforce Lightning platform. Additionally, lightning web components can leverage lightning base components (already built on web components), enhancing overall application performance. So, what is the difference between Custom Lightning components (something that has taken a significant portion of everyone's time in past 3-4 years) and Lightning Web Components. One word answer is Framework. 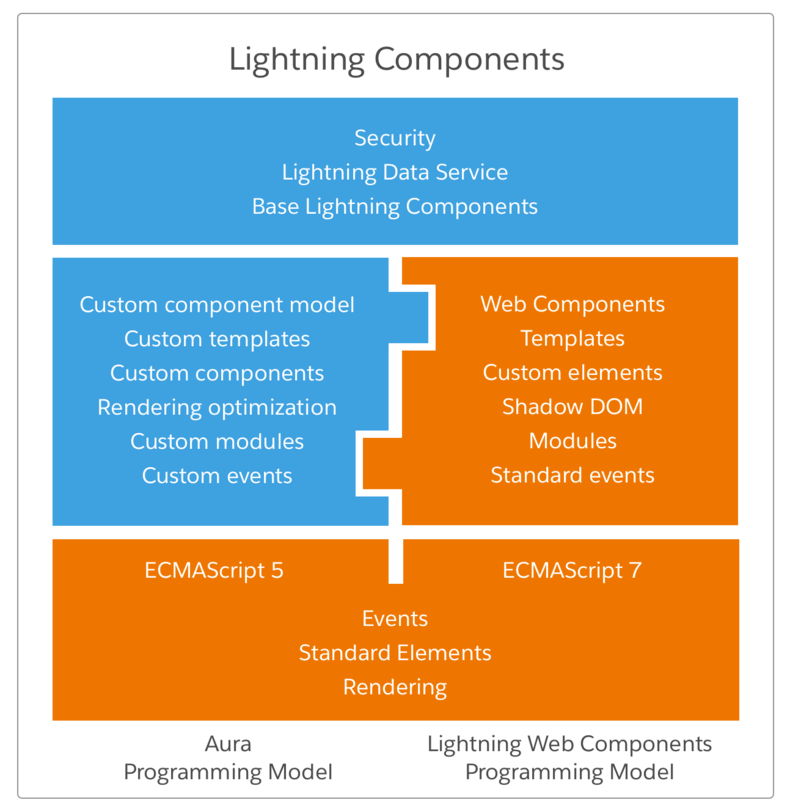 Lightning components utilize Aura framework for development and execution of Lightning components. Aura framework can be placed in same stack as Angular, React, as it provides the nuts and bolts to run your lightning components. Lightning web components, on other hand utilize browser provided features for general component scaffolding along with Salesforce Lightning web components framework (which provides features related to security, service integration and base lightning components). As a large portion of this is now native within browser, there is an obvious cost saving in terms of processing overhead. For most part, all mainstream browsers support these web standards. However, there is still come catching up to do. For e.g. Edge still do not fully support all these web standards (totally clueless about IE's support for these standards). So, if your organization still uses one of the older browsers or older versions, Lightning web components may not be useful right away. (Update Dec 15): As pointed out by Diego Ferreiro Val, Lightning web components works on all mainstream browsers, down to IE11. 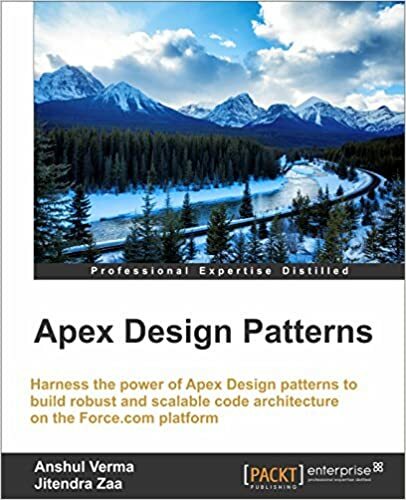 Would lightning web components become latest de-facto of publishing packages on AppExchange? More importantly, with server side rendering of visualforce pages and client side handling of lightning web components, can there is a mixed model to utilize best of both the worlds? For most part, as Lightning web components utilize HTML web components, documentation for that can be found fairly easily. Some time back I posted a solution to generate PDF from Lightning components using in-memory data. As complex and tricky this situation was, we did end up finding a stable and equally tricky solution. However, I realize that there are still lack of solutions (or maybe my search skills are downgrading) to generate and automatically download PDF document from Lightning Experience, without using any lightning components, wherein data exists within Salesforce. You can use the earlier solution in that case, but it will be an overkill. So, I ended up creating another quick solution to generate PDF documents from Salesforce. This simple solution entails adding a custom action to an object and embedding the button within object view. Now, the above solution does allow you to generate PDF. However, it's not a good user experience. 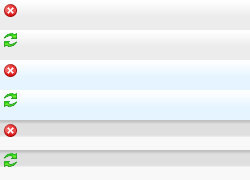 Wouldn't it be better, if the PDF is automatically downloaded with a defined name. Salesforce is undoubtedly a leader in cloud CRM and has an immensely rich set of features and capabilities. Yet, I've come across several Salesforce customers who are not quite familiar with all the capabilities of Salesforce. As I see it, it not only shadows the value that an organization can get from its Salesforce investments, but sometimes it also leads to additional costs or delays. Not to forget, you are probably already paying for some or all of these features, but may not be using them. So, here is a quick list of some awesome Salesforce features which are sometimes overlooked, but are worth looking into. Do keep in mind that some of these feature depend on user licenses and Salesforce instance type you are using. For more information refer to Salesforce documentation to get complete information on these features. We often create beautiful reports within Salesforce and share meaningful data insights with business. However, one of the pain points is that all the reports we see within salesforce are transactional i.e the reports are driven by the records that exist within Salesforce. Analytics snapshot provides us the capability to take a snapshot of a report data as per defined interval and then use it for future reporting needs. So, even if the original data is no longer within salesforce, your reports can still show those details (from data stored within analytics snapshot). It is a very handy tool when you have to deliver trend reporting or even some general reports which need data from extended time periods. This is also considered as the secret sauce of Salesforce's early success. A very simple yet elegant tool to allow your customers to speak to you and let them know that they are being listened. Salesforce has really learned and implemented really cool features submitted as ideas by the community. It does its customers to use ideas for their clients as well. So, as an organization, you can enable IdeasExchange of your own wherein you can accept new ideas, evaluate them and then progress them as needed. We all want to have completely streamlined and automated processes wherein the data is flowing efficiently towards its logical closure. For instance, in Sales, we want the leads to start flowing as soon as we receive them and progress them to closure or like in Customer Service, you would like to automatically route incoming customer service requests to agents and bringing them to closure, without any delays. A few years back, such requirement was delivered via AppExchange apps or creating custom functionalities. Bonus, one more point, which may not be that unknown, but definitely quite underestimated. I added this additional point to emphasize it's importance in maintaining a truly stable and robust Salesforce environment. Last but not the least. Most of the Salesforce developers know about sandboxes as that is where they can develop their custom functionalities. However, quite often I've seen Administrators making changes to live environment. However enticing and powerful it may seem, it is definitely not a recommended approach. Imagine, you adding a validation rule for one team, which disrupts processes for other teams. It's not impossible and happens more time than you may think. So, as I always like to say, better safe than sorry. Developer - Most basic of it all, used for code/ configuration development. Data storage limit is 200MB. Well, I'm sure a lot of you still rely on using out of the box salesforce images for displaying quick icons within formula fields or even using them within your Visualforce pages. Lately, I realized that a lot of earlier resources are no longer accessible, so I tried to quickly extract all images from Salesforce CSS files and provide a quick reference here. Please note, I've referenced all images from SF servers directly, so if anything changes, the image should stop rendering here. As these images are completely controlled by Salesforce, and in case they change anything, it might lead to image not being accessible.